The store is nice, neat and well presented. I was able to find what I was looking for with ease and with some very effective help got exactly what I was looking for. There's always something new here every week if not the shoes then the displays. I liked the atmosphere. A very professional and the staff should very well be proud of it. Thank you. I've never been in a shoe zone so well presented, I was like WOW. I was looking at 9.99 mens shoe but wasnt sure if they would do the job I need for work. The staff came and asked if I needed some assisstance. I accepted, he listened, advised then gave me the most suitable choices. I couldnt be happier with the service, it's been a long time since I recieved service like this. I believe there's something here for all the grumpy faces put there to learn from. In addition the knowledge of staff was just amazing. A true salesman pleases the customer. I am more than pleased. 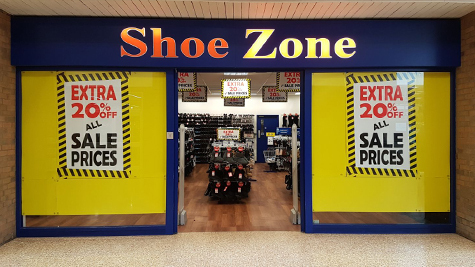 Thank you, Shoe Zone Beckton. Always plenty of variety of products,sizes ans very reasonably priced too. COULD NOT BELIEVE THAT STORE WOULD CHARGE FOR A BAG TO PUT SHOES IN A LADY IN FRONT BOUGHT 3 PAIRS OF SHOES AND HAD TO BUY A BAG TO PUT THEM IN.WHEN I WAS SERVED THE LADY SAID I HAD TO PAY FOR A BAG WHICH I REFUSED. I THEN ASKED FOR A SHOE BOX SHE SAID THERE WERE NO SHOE BOXES AVAILABLE.SO I ASKED TO SEE THE MANAGER AND HE TOLD ME IT WAS LAW ABOUT THE BAGS WHICH I UNDERSTAND ANYWAY.IASKED HIM FOR A BOX WHICH HE GOT FROM THE STOCKROOM THE SHOES DID NOT FIT IN BUT I TOOK ANYWAY.IAM SURE SHOEZONE COULD AND SHOULD TAKE THE COST OF A BAG FOR THERE GOODS. Happy, friendly staff. Good range of stock, well laid out. Excellent prices. A pleasure to shop there. The till assistant when asked about a shoe price that the customer could not see the assistant became very rudish and carried on talking to a friend while the customer stood there waiting to pay. Also as the shop sells big sizes then those sizes should be on the shop floor at all times so that the customer can see/get it. It is very good that this shop do large sizes.